Feeding the birds is one of the Joys in the Garden! 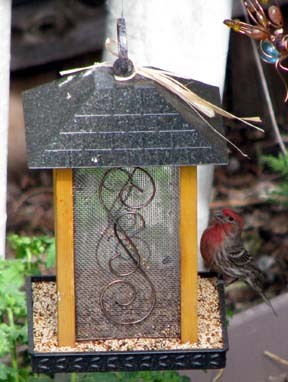 Birdfeeders have been a part of my garden landscape for a long time. I enjoy listening & watching the birds while having a cup of tea or coffee in the morning. Making plans to continue this joy in Lubbock. To attract birds in your garden, I find that feeders large enough to hold 2-3 days worth of seeds work best. I fill the feeder with high quality seeds. My feeder in Colorado was under the aspen tree so that the birds could find shelter. They could easily escape should there be predators in the yard. Although with the beagles, not many cats stray into the yard. One of the benefits of attracting birds, was that they ate pesky insects. Not sure what to do in Lubbock - we have no trees in the backyard - no shelter for the birds - nothing but a open area. Seeds & Grains that your Feathered-Friends will appreciate. Almost all birds enjoy black-oil Sunflower seeds. These seeds are easily cracked and contain a high-fat content. When I can find them, I buy the hull-less versions. The Sunflowers hulls make a mess. In addition to providing seeds, be sure to add a water source. Birds will appreciate water both to drink and in which to bathe. Circulating water is best but any tray of water will attract birds. I added a solar birdbath to the garden in Colorado. It shots water into the air. Not only a joy to watch, but also kept the water circulating. Too bad this Chinese product didn't last the season. I like to keep the birdfeeders full all year. Birds feed all year long. In the winter I put out slices of fresh fruit for them. 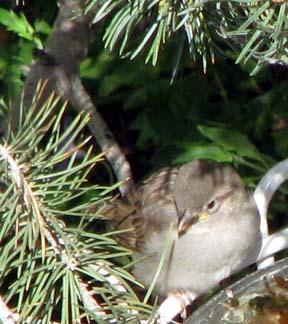 Place feeders and birdbaths near trees and shrubs which will offer sanctuary to the birds. It gives them a place to hid and a place to get out of the rain. I had a variety of Bird Feeders on our Colorado property. Some I made and other were purchased.